Kitchen islands are a must for luxury homes because homeowners love the extra storage, seating, and workspace. There are six basic types: L-shaped, U-shaped, Galley, Circular, Rolling, and Furniture Style. Each has its own strengths and weaknesses. 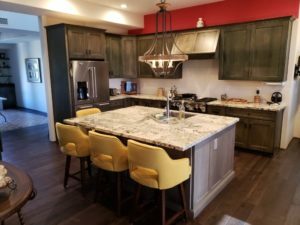 For example, a round or half-moon island can accommodate the most seats, but unless you employ the creative solutions of Cornerstone Cabinet Company professionals, storage space is quite limited. Whichever style you choose, keep on trend by including kitchen island cabinetry for dishes and appliances, a second sink, and pub chairs for casual dining. Learn more about choosing the best kitchen island for your space here.